If an 8 year old can make Nutella Stuffed Strawberry Chocolate Cupcakes, you certainly can do it! 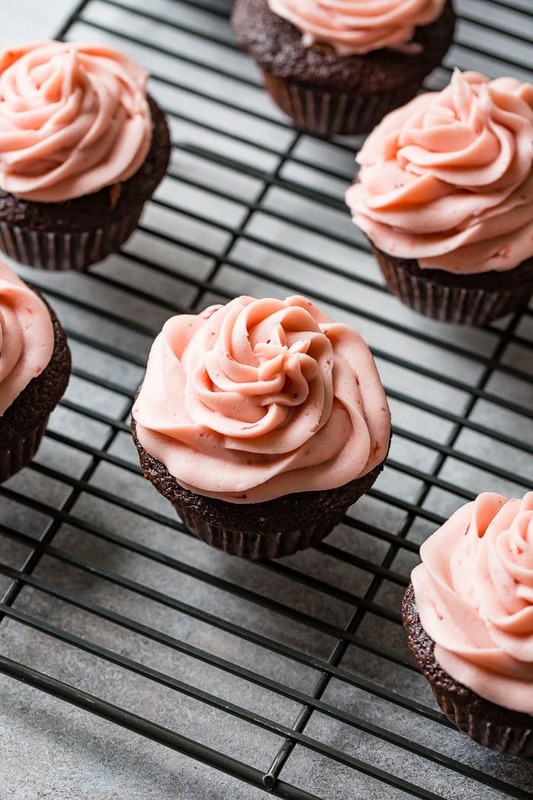 Moist chocolate cupcakes are a must for Valentine’s Day! Are you familiar with how cooking happens in our house? It’s not just a mom thing, and it’s certainly not just an adult thing, the whole family is involved. 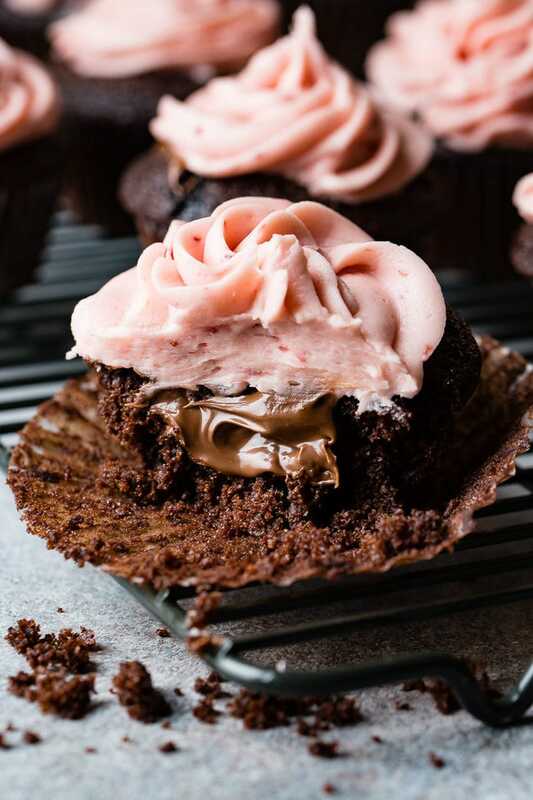 I’ll tell you all about how our family created the tradition of kids cooking, plus a few tips for making it work in your home, but first, let’s chat about these Nutella Stuffed Strawberry Chocolate Cupcakes. I love the look of chocolate and fluffy, pink anything. I’m not really a pink girl, I think I have one or two pink shirts in my closet and that’s probably it. Now don’t panic, I have nothing against pink, I’m just not drawn to it like I am blue or white for example. I should move to Santorini, Greece. That seems like a good choice. Ahhh but chocolate and pink, there’s something about that just makes me want to take a big ol’ bite. 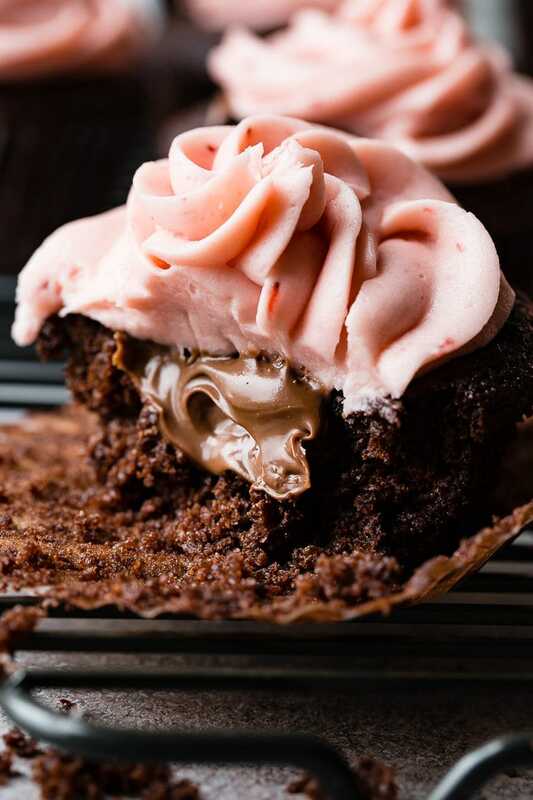 And these Nutella Stuffed Strawberry Chocolate Cupcakes are the perfect example. 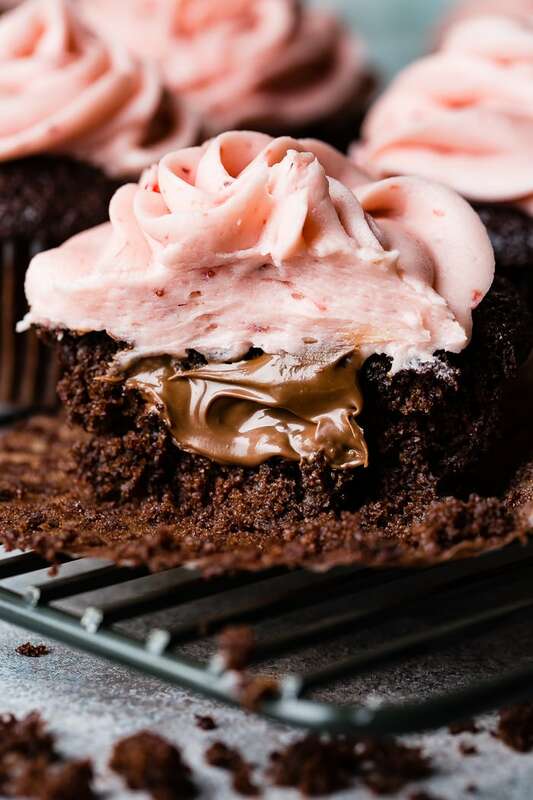 A moist chocolate cupcake, stuffed with totally lickable nutella and topped off with strawberry buttercream that is silky like those old school 90’s silk pajamas. Nothing short of a dream. You all know us well enough by now to know that we don’t drink alcohol, coffee or tea and while yes, alcohol usually cooks out of things, we don’t keep it in the house so it just doesn’t happen. When it comes to chocolate cake I’ve had to embrace that it does in fact make a difference. I bought this, Espresso Powder used for baking and I merely add a little to any liquid in chocolate baking and it enhances the chocolate flavor without adding any coffee flavor. I honestly still skip it all the time, but really, it does make a difference and you’re probably eating it most of the time you buy a chocolate anything out and about. Have you noticed how many chocolate recipes include boiling water? Especially a chocolate cake or cupcake. So what’s the deal with boiling water in chocolate cake? It seems like it would be something with the hot water making the cake more moist or tender, but it’s actually about the cocoa. When making anything chocolate you should mix cocoa with hot water then let it sit for a few minutes. What you’re actually doing is blooming the chocolate, or in other words, the cocoa dissolves and the flavor particles are released leading to a more powerful chocolate flavor. Chocolate brownies are a little different, you’ll want to bloom the chocolate in hot oil. Not like, fry you up some fried chicken oil, just warmed up so that it will activate those particles. It seems to me that chocolate cake has the most issues when it comes to being perfectly moist and tender. If you’ve made cake before you you might notice that while your white cake comes out perfect your chocolate cake ends up dry and crumbly and you KNOW you’ve followed the exact directions. Here’s a few reasons your chocolate cake is dry. You’ve used a hot liquid which cooled and evaporated some of the liquid. You know that boiling coffee or water that you cooled back down to room temperature? While cooling the liquid begins to evaporate and you can end up losing up to 2 ounces purely from evaporation! You didn’t properly measure your flour. Remember, there’s an actual science to baking and this one tip on measuring flour is LIFE CHANGING. Too many holes leading to a dry cake. This happens most often because you over-mixed or mixed improperly. Cookies can handle more mixing, cakes and quick breads need to be gently handled. Over baking is a huge culprit. We tend to worry about a gooey middle and therefore push the cake until it’s been over baked. A cake should be pulling away from the edges, have a bright spring when you tap the middle and when you insert a cake tester or toothpick into the very center it should come out clean. We now understand what can ruin a chocolate cake, leading to something as dry as stale bread, but what makes chocolate cake moist? Butter not Margarine: Margarine has extra water in it which will dry out your cake. Has the butter been brought to room temperature? Butter that is too cold or too warm will absolutely change how the ingredients combine and bake up. Try adding part or all oil instead of butter. Water evaporates from butter in the baking process while oil maintains moisture. Place plastic wrap over a hot liquid as it cools before adding it to the cake. This will keep moisture from evaporating. Which Frosting for Chocolate Cake? Chocolate cake is such a classic. It’s a perfect cake to really play around with the frosting as so many go well with chocolate. If you’re like me and love the brightness and fresh taste of berries you’ll love a buttercream flavored with your favorite fruit or jam. 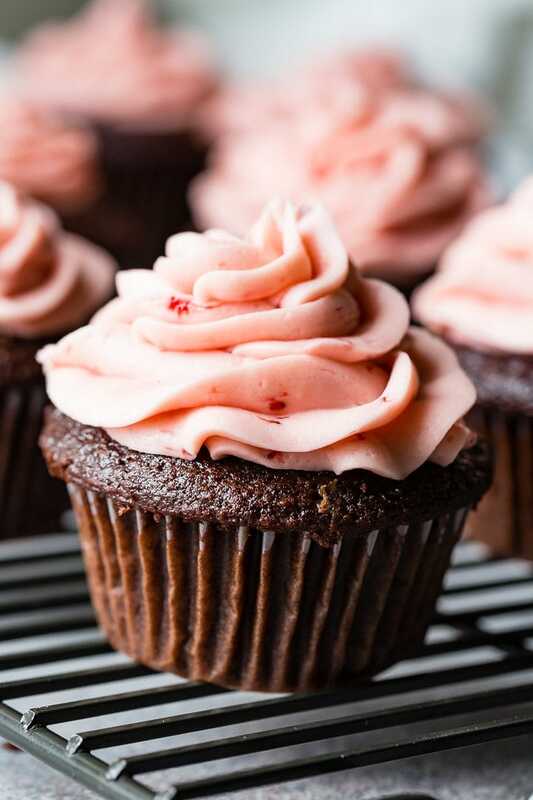 That’s why these chocolate cupcakes have a strawberry buttercream on top! A strawberry buttercream is one of the best frosting recipes to keep on hand no matter what time of year it is. It’s simple, fresh and has great color to brighten up any day or holiday. Ahhhh now that’s the question isn’t it. I mean, who has time to bust out their own strawberry preserves just to make frosting? It’s much easier to use jam. But are all strawberry jam buttercream recipes equal? When making a fruit buttercream it’s important to look for a high quality seedless jam. The seeds not only get obnoxious in a frosting, but they also can separate the frosting as it mixes. Unfortunately the best answer is to buy a few preserves in the store and sample them at home as it all depends on your tastes. How Long Will Chocolate Cake Last? Chocolate cake can be stored a few ways to keep it fresh and tasty. Store chocolate cake or cupcakes at room temperature for a day or in an airtight container in the fridge for up to 3 days. Cupcakes can be wrapped in plastic wrap, placed in freezer bags and stored for up to 3 months in the freezer. Oh, but what about frosting and buttercream? Can you freeze frosting? You can store it in an airtight container for up to 4-5 days or in th freezer for up to 3 months. Make sure when you defrost the frosting you do so in the refrigerator versus just sticking it on the counter. I’ve watched so many people use a piping tip to squirt a filling into a sealed cupcake but I’m here to beg you to stop. Forcing a filling into a space that has no hole demands that space be forced into creation. This breaks the cupcake and generally under-fills it. 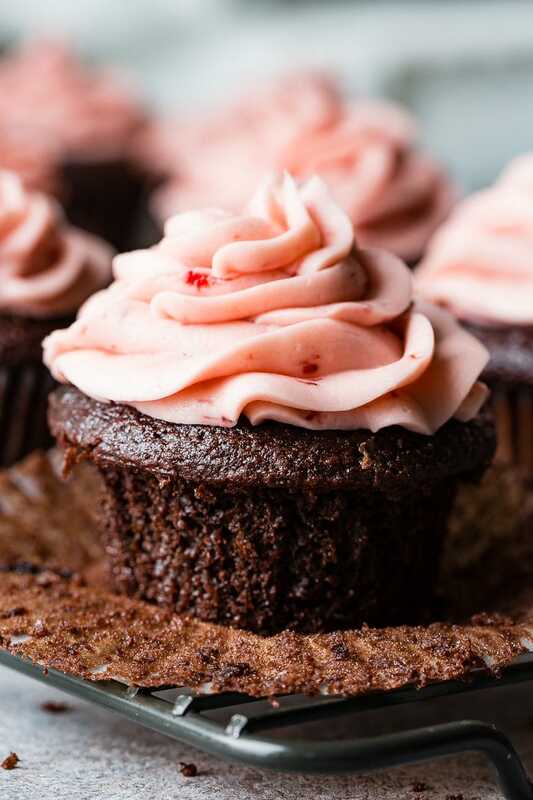 The best way to stuff a cupcake with nutella is to use an apple corer or serrated steak knife to cut a core out of the cupcake and fill it using a spoon or piping bag. I prefer to keep the cake that has been removed, carefully slice off the top lid of the removed piece of cake and gently place it back on top of the cupcake. This helps to keep the filling moist and and you get more cake. The cake is actually my favorite part? In fact, I’m curious, if given a cupcake do you savor the cake or the frosting? And how do you eat the cupcake? Take a big ol’ bite or create a cupcake sandwich? Ahhhh or are you a fork person? Looking for more cupcake recipes? Raspberry Lime Cupcakes, Milk Chocolate Cupcakes, Apple Cider Cupcakes, Carrot Cake Cupcakes or Spice Cupcakes with Cinnamon Cream Cheese Frosting! If an 8 year old can make Nutella Stuffed Strawberry Chocolate Cupcakes, you certainly can do it! Moist chocolate cupcakes are a must for Valentine's Day! Place the chocolate and cocoa powder in a medium glass bowl. In a measuring cup, add the hot water and espresso powder, stirring to combine and bloom. Pour the hot coffee over the chocolate mixture, whisking gently until smooth then cover in plastic wrap and set aside to cool completely. Line 2 standard 12-cup muffin tins with foil or paper liners. Whisk the oil, eggs, vinegar, and vanilla into the cooled chocolate mixture until smooth. Pour the chocolate into the flour mixture, stirring until smooth. Using a spring-loaded scoop, divide the batter evenly among prepared muffin cups, filling 3/4 full. 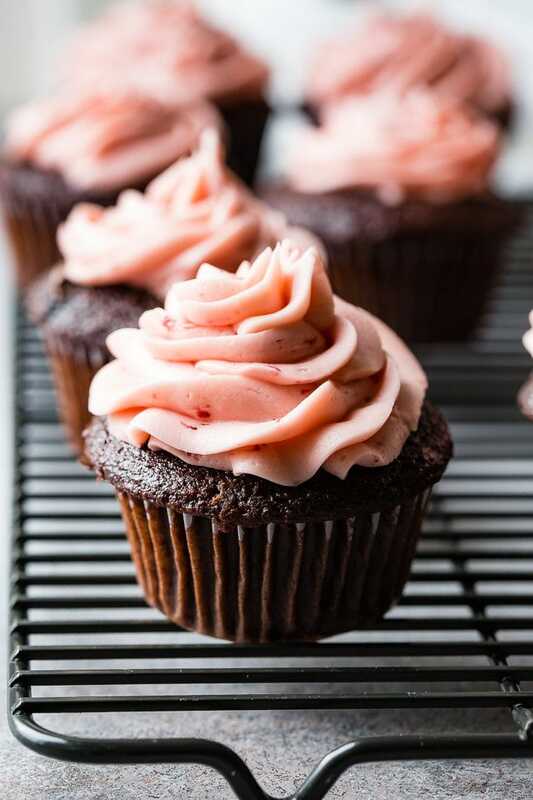 Bake until cupcakes are set and firm when you press on the tops, about 17 to 19 minutes. Remove from the oven to cool. Using an apple corer or pairing knife, slice a small section out of the center of the cupcake. Make sure you do not pierce to the bottom. Fill each hole with 1 heaping tablespoon of Nutella. We like to pop the very top of the cupcake core we removed back onto the top of the cupcake before frosting. In the bowl of an electric mixer beat the butter until light and fluffy. Add in the vanilla, strawberry jam and powdered sugar, one cup at a time, beating well on medium speed. Transfer the buttercream to a piping bag fit with a decorative piping tip (I used this one). Frost and serve!